Of all mass cultural forms, popular music has historically been characterized by the greatest independence for artists and allowing access to a broader diversity of voices. However, in the contemporary period, this independence is being threatened by a shrinking number of record companies, the centralization of radio ownership and playlists, and the increasing integration of popular music into the broader advertising and commercial aspects of the market. Narrated by Thurston Moore of Sonic Youth, Money for Nothing features interviews with hip-hop legend and pioneer Chuck D, respected independent artist Ani DiFranco, Michael Franti of Spearhead, and Riot Grrrl co-founder Kathleen Hanna (of Bikini Kill and Le Tigre). It also includes interviews with popular music historian Professor Reebee Garafolo, ex-Rolling Stone editor Dave Marsh, political economist Robert W. McChesney, and Shirley Halperin, editor of BOP magazine. 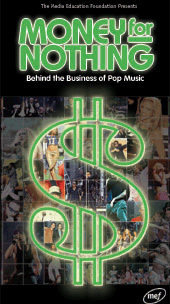 Money for Nothing succinctly explains how popular music is produced and marketed, and offers an accessible critique of the current state of popular music.